I started my blog, The Book Stop, not too long ago actually. April 16th this year was the day I decided to just go ahead and start my blog. Wow, there are so many great things about book blogging! I think my favourite would be the amazing community of bloggers. I have made so many friends since I started blogging. From Goodreads to Twitter, the book blogging community is everywhere! I get so excited when I see that someone has commented on one of my posts, and it really makes me feel great that there is someone that actually enjoyed reading a post of mine! I also love how connected you are with authors. I've had so many great conversations with some of my favourite authors! There are lots of perks of being a book blogger, I love it so much! I read a lot of different genres, but most of my reviews are of YA books. I still love adult books though! My favourite genres are contemporary, dystopia, mystery and humour. I try to review every book I read, and I like to go into detail about what I liked and disliked about the book. I just have a wide interest of books! Oh, wow. This is always a hard question, because there are so many books that I've read and loved! Okay, well recently I read a brilliantly written book by Vikki Wakefield, Friday Brown. It had such a unique story line, and I really admire Vikki Wakefield's writing style. So that's definitely one of my favourite books! But I also love the Divergent series, Gone series, Monument 14 and The Cold Eye of Heaven. So many great things have come out of blogging! Well this didn't really happen because of book blogging, but I got to personally meet Michael Grant, author of one of my favourite series 'Gone', when he came to Dublin earlier this year! I had such a great time and got to ask him lots of questions over a glass of coke. I was also so happy when two of my favourite authors, Vikki Wakefield and Emmy Laybourne sent me some book swag just because I spread my love of their books on Twitter! Authors are awesome! But I have experienced so much since I started book blogging! Share your favorite literary quote! My 10 year old put my spine poetry together. He absolutely loves doing it! I think your poem is great though :D Jaclyn @ JC's Book Haven. I kind of cheated with this one. I'm not to creative when it comes to Poetry so I posted one from my childhood which is still a favorite today. I like your poem. And I'm totally jealous that you went to BEA. I'm sad I didn't go. I'm saving money. Great titles! This is such a fun question. I actually did two! :D My FFs are at Musings on Fantasia and LKHill. Happy Friday! This was a fun question this week! Also.. I want to say that I love that you post the next week's question early. I was able to work on my post today when I had time instead of squeezing it in tonight! love the fun that we got this week! I enjoyed trying to put books together to make something sound good! Hi following thru from Parajunkie's follow friday. New follower, u can follow me back at "SnowRavyn's Reviews"
Such a fresh and fun question and I cannot wait hopping around to see other people's answers =) I've not heard about Just Like Fate but the title alone already made me want to read it. What a creative question!! *giggles* Im so bad at writing! I'm new this week! I'm excited to make some friends! Hey all that counts is you attempted it lol. I'm not good at it either! But very nicely done, Alison! 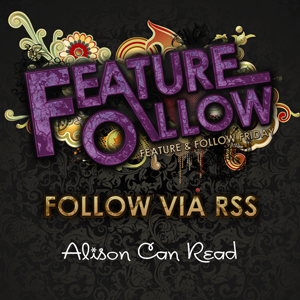 I really, really love this week's activity, Alison! And I think your poem is very good. It shows that we can all be at least a little creative, and it's so much fun to run and hop around all the blogs today to see what everybody came up with! Have a fantastic Friday :) Here's my FF post for this week. Nice!! I am not very good at poetry, but hey.. had a crack!! Nice poem:) I really liked this activity, I'm not good at poems but it was much fun! Here is my attempt to write poetry. Hey Alison! Happy Friday! And I'm jealous you have Frozen. Have a great weekend. I did't see Easy at BEA! I love the spine poetry this week. Great idea. Hi! This was my first Feature and Follow Friday. Please let me know if you have any suggestions for my blog post. I am really excited to join this weekly meme and look forward to following all of your blogs! This is such a fun one! Find my poem here. I had a hard time with this activity too, but it was a lot of fun. Great idea! Old follower. This is by far my favourite question / activity! :) Had such a giggle raiding my bookshelf for this. Old follower by GFC, email, and Twitter! Awesome Feature! Haha I am terrible at poetry but I had a blast doing it. I love your poem! The start is so great (Heartbeat, Just like Fate). Alison like I said to Rachel, the activity is fantastic, it puts a bit of extra spin on things so as to not get boring. I was also saying that maybe we can do a Google docs for activity/question suggestions and would you all consider posting the future topics so we can draft/schedule our posts? Beneficial content. Appreciate it with regard to expressing. I'm keen on the item a lot. I'm new to the follow friday hop, so I'm not 100% sure if I've done everything right but hey! This is such a great idea for a hop, thanks for hosting. I'm new to the hop and blogging :) The spine poetry is fun!